The right of Ben Galley to be identified as the author of this work has been asserted in accordance with the Copyright, Designs and Patents Act 1988. All rights reserved. No part of this book may be edited, transmitted in any form or by any means (electronic, mechanical, photocopying, recording or otherwise), or reproduced in any manner without permission except in the case of brief quotations embodied in reviews or articles. It may not be lent, resold, hired out or otherwise circulated without the publisher’s permission. Permission can be obtained through www.bengalley.com. Ben Galley owns the right to use all images and fonts used in this book’s cover design and within the book itself. All characters in this book are fictitious and any resemblance to real persons, living or dead, is purely coincidental. 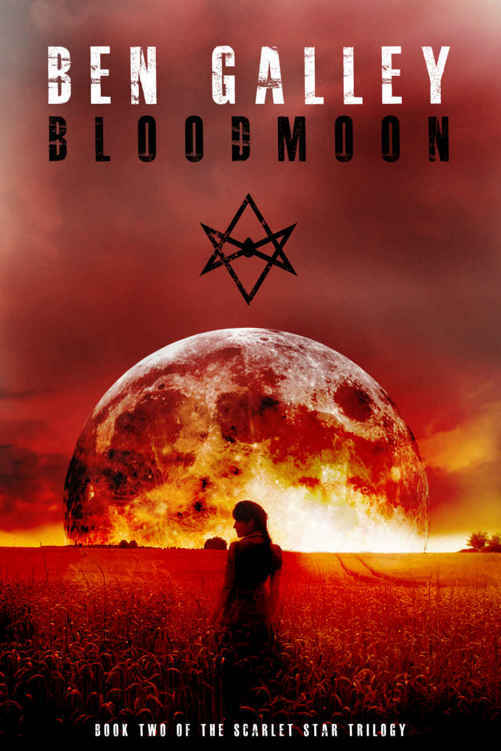 Reviews and shares are really important to indie authors, so if you enjoy Bloodmoon, let somebody know, so that way they can enjoy it too. Ben Galley is a young indie author and purveyor of dark fantasy from rainy old England. Harbouring a near-fanatical love of writing and fantasy, Ben has been scribbling tall tales ever since he can remember. When he’s not busy day-dreaming on park benches or arguing the finer points of dragons, he works as a self-publishing consultant, aiding fellow authors achieve their dream of publishing. Below are some of the songs that inspired me along my writing journey, and I hope they inspire you too, in any way that they can. Enjoy. This book is for Lily. oats never do what they’re told. They think they’re smarter than us, think they know which way is best, like they’ve got a secret they won’t tell. At least that’s what Barnamus perceived, as his narrowed eyes glowered, almost murderous in the meaning, at each mischief-making one of his herd in turn. He swivelled his head—though not his eyes, for you never take your eyes off a herd of goats in the desert if you can help it—and spat to the side. A quick flick of his gaze, and he arched a lip in wry dismay. Another miss: the sliver of driftwood lay unsoiled, just sunbathing smugly in the day’s scorching glow. The tobacco-stained spit sizzled softly in the sand, adding melody to the clomping rhythm of the goats trotting about, and digging up whatever roots and nibbles came their way. The earth wasn’t as barren as it could have been. Rivers tend to help with that. This one glittered away behind him, crisp and calm as a slab of pure marble. Barnamus didn’t much care for water, especially not great vast lumps of it, lapping casually at the heat of the desert, distracting his goats. Goats like water, though to look at them, you’d never know it. The goatherd snorted, hawked, and spat again. Another shift of the eyes, and this time he grinned, baring two rows of tobacco-stained teeth. A hit. That meant it was time. With a grunt and a sigh, the old goatherd planted the trail-bitten soles of his boots on the ground and hoisted himself up with his stick. He gave a sharp whistle and poked the goats one by one into a rough group, as together as goats like to be. They needed a firm hand at all times, and he like to be more than firm. As Barnamus led his herd a winding muddle through rocky outcrops and cactus patches, following the shoreline, he cast wary glances at the water’s edge. Driftwood, lots of it, had been pushed ashore by the desert breeze. Each piece was charcoal-black and smoothed by fire. Barnamus wrinkled his brow. An hour trudged past, one thankfully free of any escape attempts from the mischievous goats. The river bent, and the shoreline with it. The goatherd and his charges had to scrape through a cut in the rock to reach the flat, open ground beyond the curve. Destruction has a penchant to be noticed and adored. It tugs at the eyes, yanking a gaze into its clutches before the mind can get up out of its chair. Whether it is manmade or Maker-wrought, you can’t help but stare. And so it was that Barnamus stared, wrinkled eyes cranked wide, at the smoking hulk of a mighty riverboat that was crumpled against the far shore. The once grand-looking vessel had been gutted by fire. It slumped like a drunk in the water, still clinging on to its anchors, a black shell of broken iron, still smoking in places where the cinders burnt on in the daylight. The river water around its belly was stained oily, black as the iron in places. Barnamus tapped his goats away from the water, whacking their skinny legs with his stick and whistling at them sharply. One started to trot away, but a hoarse shout and a look that promised a firm grip and a sharp knife brought the little beast right back. The old goatherd fished a spyglass from his beaten-up satchel and peered through it, screwing up one eye. He could see nothing but ash and dead metal, and nothing in the water for the old goatherd to scavenge. Barnamus shrugged disappointedly and poked his goats onwards. He got them ten paces further on before one of the beasts made a break from the herd. Spooked or distracted, it cantered down to the shoreline, with an angry Barnamus hot on its wiggling tail. ‘Get back here!’ he barked. Barnamus rushed forwards as fast as his aching legs would allow and slid to his knees. It was a young woman, lying face-down in the sand, pale where she hadn’t been burnt black. He gulped, feeling a cold sweat come to chill his roasting forehead. There were vicious red burns running over the right side of her head, where her blonde hair used to grow. What was left of it was matted and singed, sometimes right to the scalp. The burns trailed down her neck, and spread across her right shoulder and upper spine. He had that awful urge to touch her wounds, as if his brain were having trouble processing their reality. He bit his lip and bent down. As his finger gently grazed her raw shoulder, the body moved and something hissed against the wet sand. The goatherd had thought her dead, and staggered back. With all thought of his goats forgotten, knowing they would be halfway to Missipine by now, he set about trying to lever her up with his spare arm and his stick. She moaned, crying out weakly as he manhandled her into a sitting position. He tried to lean her against a rock so she could rest. With his eyes screwed shut, so as not see the burns hovering just inches from his face, he managed to prop her up, letting her head and shoulders slump over her soot-smeared chest. For a moment, the girl did not move, and Barnamus feared she had finally drifted off, that he’d killed her with the strain. Then he felt her face move, and felt her mouth on his hand. She choked, managing only a little, but that was a start. ‘Mmm—’ was all she could manage. Barnamus rubbed his sweaty brow, letting his hat slide back for a moment, wracking his brains. He couldn’t just leave her. Though he had the goats. But she was in a bad way. He scratched an itch deep in his thinning hair, and tapped his teeth together. Barnamus moved to the water and brought some back in his hat. He poured it gently over her burns, washing the sand and soot away. He winced as she moaned again. ‘I’m sorry,’ he muttered. Barnamus went back to the water three more times, until the girl was soaking wet, but cleaner. Infection and desert tend to go hand in hand. Then he sat with her until she came around again. She tried to lift her head, and the goatherd moved a strand of her hair so she could look at him, sideways, through one bloodshot, raw and smoke-poisoned eye. ‘Who are you?’ he asked again. ‘I’m …’ she paused, her eye roving about, taking in her surroundings. ‘Maid.’ It was just a hoarse cough. The eye closed and the girl shifted against the stone, wincing when she caught her burns. A tear rolled down her grimy cheek. Barnamus could sense her pain. He bit his lip. There was another faint shift of the head that might be construed as a nod. With a great amount of effort, wincing and biting her raw lips, the girl raised her head so she could stare at the old goatherd with both eyes. As her matted hair fell back, he couldn’t help but gasp. The fire had kissed the right side of her face too. The raw red burns wandered across her forehead, cheeks, and jaw, reaching almost to her nose. Her ear was fused to the side of her scalp, and her right eye was a puffed-up slit through which she could barely see. he soldiers trudged in through the gate with bleary eyes and heavy feet. The smiles with which they had strode out just four days before had long since faded, stolen by fear and replaced with masks of grim resignation and furious resentment. Battle-stunned, they called it. No soldier likes to be shown their weakness, and that goes double for an officer. Weakness meant losses, and it was painfully obvious that this column of men and women was decidedly shorter and thinner than when it had left. Nobody was more aware of that fact than the good Major Doggard. His eyes, wide and red-rimmed, stared down the spear-straight thoroughfare that led to the door of the Brigadier General’s lodge, square in the centre of Fort Kenaday. His face was devoid of colour, save for a few crimson scratches here and there, and his flaming red hair, usually so neatly groomed, was a sweat-soaked mess. There was a bang as the door to the lodge was thrust open, and a rotund, red-cheeked man came striding out. His body screamed of a lifetime spent in a sedentary occupation, eating food of dubious vitamin content. His thinning hair was slicked back behind his head to cover his baldness. Flapping jowls puffed from blushing cheeks. He had a mean glare in his little eyes, which were like two flecks of coal poked into a red cushion. In short, Brigadier General Linton Lasp, of the Third Frontier, Master of Fort Kenaday, did not look the slightest bit amused. ‘Brigadier General Lasp, Sir!’ Major Doggard swung a very long and very large gun off his shoulder and hefted it into a salute, then signalled for the column of dusty, bloody soldiers to halt. ‘You’re all dismissed,’ ordered Lasp. His words would have practically dripped from his mouth had his tone been any oilier. To the Brigadier General, sarcasm was nought but an accent, so natural that contempt might be mistaken for a speech impediment. He was a high-born officer with a penchant for throwing his ample weight around, and Major Doggard knew this very well. If he could have turned any paler as he stood there, in front of all the people gathered to hear his dressing down, he would have. But by some luck of the Maker, it never came. Lasp simply leant in close and spoke two words low and firmly. The major nodded, saluted, and marched briskly towards the lodge, leaving his soldiers to disperse into the crowds, silent and grim. Before he turned to leave, General Lasp cast a scowling glance around at the gathered people, refugees from the frontier towns. They were a bother to his operation, as far as he was concerned. His gaze found a particular pair of eyes, eyes he recognised, and he scowled all the more. Tonmerion glared right back, until the general was forced to turn away. Merion shrugged, looking up at the dark shadow of Lurker’s face under his dusty hat. His eyes had that squint to them, the one that told Merion he was deep in thought. Several of his old scars could be spied beneath his collar. Merion had always marvelled how the prospector stayed so stocky, instead of sweating away to nothing under the leather coat and britches he always insisted on. Merion stared at the little scratches in the elbow and shoulder of the coat, and idly wondered where Jake the magpie had got to. ‘Doesn’t make any sense. I couldn’t care less about who he is, or his precious fort. All I care about is why he isn’t letting us leave. We need to be heading east,’ Merion said. Merion paused to look at a nearby soldier, hanging limply over the shoulders of another, older man. The soldier was missing an ear, and his eyes, as hollow and cold as winter’s breath, stared vacantly at the dusty ground. The prospector grunted his assent. ‘You reckon he can get her out of the fort?’ he asked. Merion shrugged again. ‘Says so,’ he answered, his voice a little lower, a little harder. Lurker caught it in an instant. Merion’s stomach rumbled in agreement. The food at Fort Kenaday was truly awful, to say the least. Tough old meat, if they were lucky, and watery stew if not. And that was just the tip of the iceberg. Lasp had billeted all the ‘refugees’, as he called them, in one cavernous shed, where hammocks were stacked five high and bumped together in the night. Merion could barely keep track of which hammock was his. He had almost lost his bag twice, and a faerie along with it. Rhin had taken to sleeping under the lodge, eavesdropping on all the unsuspecting refugees’ precious secrets. Maybe he hoped this would make Merion curious, and cause him to break his vow of silence. Tonmerion Hark snorted at that. Lilain was waiting for them at the shed, leaning in the shadows of its doorway, out of the scorching rays of the afternoon sun. The summer in south Wyoming was mercilessly hot. She wore a wide-brimmed hat just like Lurker’s, and was leaning heavily on a crutch Lurker had made for her from some old table-legs. Her knees were still wrapped in bandages, and her face, though on the mend, was a mishmash of bruises and lumps, spanning a spectrum of yellow, purple, and green. Stiffly, Lilain tottered out to meet them, ruffling Merion’s hair when he got close enough. Merion endured her affection with a grimace, and she rolled her eyes. He had become a different boy since his final night in the Serpeds’ company. He was quieter, more withdrawn, as if some of the childhood in him had been cut away. Every night since then, she had prayed silently to the Maker that it was only temporary. ‘There,’ Lilain pointed to a barrel over by the fort’s tree-trunk walls, where a faint shiver hid in the shadow. ‘Be careful,’ replied her nephew, almost begrudgingly. ‘I will,’ Lilain replied. Merion just nodded again and trundled past her and into the shed, wrinkling his nose at the smell of too many fort-ripe bodies in close proximity. ‘That boy’s not so much a boy any longer,’ commented Lurker. Lilain watched her nephew leave, and tutted. ‘Shame on you, John Hobble. That boy has been through a lot. He’s lost his father. He’s both drunk and drawn blood. Now he’s lost a friend, and found a murderer instead. He’s only thirteen,’ she admonished him, lightly. Lurker adjusted his hat, saying nothing. ‘I need to get these legs movin’, need some fresh air,’ she said, then she took a breath, and patted the hand before hobbling away towards the shadows. Lurker looked up at the sun, drifting westwards with all the leisure and laziness of an undisputed king. Reaching inside his leather jacket, he fished out a pipe, and then struck a match against his several days’ worth of bristly stubble. The pipe clacked against his teeth as he puffed. The wind blew then, a strong, warm gust from the desert that whipped up the sand and sent the smoke curling into his eyes. Lurker cursed. As he raised a hand to wipe the grit from his face and the sting from his eyes, a scrap of paper cartwheeled across the dust and flapped against his boot. Lurker trapped it with his heel and bent down to read it. The prospector hummed to himself before picking up the paper and folding it into his pocket. The pipe clacked against his teeth once more. ‘I’ll be fine. Stop asking,’ Lilain replied between grunts. Lilain wanted to reply with ‘Do you blame him?’, but she held her tongue for once, and kept hobbling. They were close by the northern edge of the fort, where the walls narrowed into a point. There was a small gate nestled into the walls. No soldiers were in sight, just a few stableboys and a farrier, who was snoozing in the shade of a stable. It was exactly as Rhin had told her, and it had been like this for two days now. Rhin led Lilain forward, barely casting a shadow even in the sunlight. She pretended to be wandering aimlessly, staring up at the sky and the spiked walls of the fort. When she looked back down, she had lost sight of Rhin. She kept going, her eyes rushing over the dust and stones. Then she spied a little hand waving towards the gate. The stable boys were distracted by throwing nutshells at the dozing farrier, trying to land one on his lolling tongue. Lilain kept her head down, and ducked as low as her wounds would allow. Even this nervous beating of her heart was far better than lying in a cramped hammock with nothing to do but glare and itch. Rhin was now climbing to the lock on the small wooden gate, cut from the tree-trunk walls, resting on thick hinges. There was a rattling of sharp steel in the lock’s mouth, and open it sprang. Lilain helped with the bolts, wincing every time one squeaked. She needn’t have worried; the stableboys were far too immersed in their game. Lilain squeezed through, and then they pushed it to, wedging a boulder under its lip so as to make it appear locked. ‘This way,’ Rhin said, becoming a little more visible so she could follow him. A cluster of buildings sat around the angle of the walls, huddled and bunched as if they were queuing to get inside. A few more stables, another blacksmith’s shed, and a handful of houses was all that stood between them and the scrub of the hills to the north. Rhin licked his lips as his keen eyes roved over the buildings. Most of them were abandoned, on General Lasp’s orders, but the stables still held the running horses for the post, and a few messengermen. ‘Easy,’ snorted Rhin, as he led Lilain a meandering route around the back of a tumbledown house and out behind an outcrop of rock. Before they knew it, they were in the desert, taking in the warm glow bouncing off the sand, their noses full of the smell of the burning earth. ‘The sun’ll be falling soon,’ Lilain said, casting a look back at the fiery orb that dominated the blank, endless blue of the Wyoming sky. There was not a cloud to be spied, not even on the jagged horizon. Rhin patted the sword at his waist, feeling the heat of the pommel against his palm. ‘Easy again,’ he chuckled. Lilain had to smile. The faerie certainly did make hunting more interesting. Lurker said it was boring letting Rhin do all the work, but Lilain wasn’t quite ready to go loping after prey across the hot wilderness. She was already sweating buckets from the effort of using the crutch, and suffering from a dull pain in her legs. The odd pair made their way out into the desert, weaving through rocky gullies and between boulders. Rhin sniffed the air and poked into cracks and shady holes. Once a scorpion came out of one to challenge him, but it quickly retreated when a black sword clanged against its armour. After an hour, maybe more, Lilain noticed some tracks in the sand that led them a meandering path to a hole between two boulders. Rhin quickly ducked inside to sniff. ‘Smells odd. Could be rabbit,’ he mused. She hobbled back so she could rest up against a rock, close to the mouth of the burrow. She took off her hat and let the sun shine down on her sweaty and tender face. Poking experimentally, she winced as she felt each cut, bruise, and loose tooth. One of her eyes was still swollen. Rhin would not have dared to say she looked awful, she knew that. Sometimes even a known truth is best kept behind a tongue, and this was one of those times. ‘It would have heard our footsteps already,’ she said. Lilain shrugged. It suited her just fine. ‘How do you know it’s a he?’ she smirked. They settled down in the hot sand and fell quiet, listening to the desert shiver around them in the breeze, to the rattle and buzz of the insects, and the vultures’ cries, urging the living to hurry up and die. Another hour passed, and Rhin decided it was time to creep a little closer. His feet fell softer than feathers upon the sand, and he drew his sword without a single whisper of metal. Fae steel can be quiet when needed. Rhin peeked around the edge of the rabbit hole and raised a hand. He began to rub his fingers against each other, so they made a strange creaking sound: tough Fae skin rasping against itself. It was loud enough to elicit a soft rustling from deep in the burrow. Rhin fell back from the lip of the hole. He froze there, eyes unblinking, limbs unflinching, just waiting for whatever had burrowed below to rear a head, so he could lop it off. Lilain looked on, as rapt as the faerie was. It took several moments for the owner of the rabbit hole to present himself, and he did so quite spectacularly, for it was not simply a fluffy pair of ears or a twitching snout that appeared first, but a pair of wickedly curving brown antlers, like those of a stag. Though much smaller, of course, tiny in comparison, they were still dangerous enough for a creature of Rhin’s stature. They reached almost higher than he did. Lilain looked on, her face wincing with excitement. Rhin faded to nothing, letting his magick hide him. Rhin’s body ached to leap forward, but he held back, waiting for the perfect moment to strike. Now came the twitching snout, like that of a hare’s. Indeed, the rest of the head that quickly followed it was very hare-like as well. Black eyes embedded in a brown furry face, with long ears that stuck out behind the strange antlers. Without a sound, Rhin plunged forward, bringing the sword down like a hammer on an anvil. The strange little beast noticed him at the very last second, as the faerie shivered into view. But by then it was too late, and the sword plunged into the base of its skull, stealing its life away before it had a chance to blink. ‘It’s a jackalope!’ Lilain hissed, as though she could scare its corpse away. ‘A what?’ Rhin asked, wrenching his sword free and wiping it on the creature’s fur. Lilain crawled further forwards so she could look at the strange little antlers, sprouting from a bony growth in the jackalope’s forehead. ‘You’ll offend the jackalope,’ Rhin replied, hauling it towards her. ‘And thanks for reminding me,’ Lilain muttered stonily as she tested one of the horns with her thumb. Sharp as a tack. Lilain poked and prodded at the dead jackalope as Rhin sheathed his sword. ‘Sorry,’ he mumbled sheepishly, for the second time that day. Rhin took out his sword once more, and set to hacking the antlers away. The black steel made short work of them. They soon fractured away, and Lilain laid them atop a stone above the burrow’s mouth before slipping the limp jackalope into a bag she had brought. Lilain nodded, shouldering the jackalope and reaching for her crutch. Rhin walked alongside her, slower now their work was done. His mouth was already salivating at the anticipation of roast meat. ‘Do you think he’ll ever talk to me?’ Rhin asked abruptly, as their feet crunched over the stones. Lilain thought about that for a moment, trying to find an answer that sat comfortably between honesty and hope. Those were always the best kind. ‘You’ll have to give him time, Rhin, possibly a lot of it. He’s dealing with so much, and it’s only been a week,’ Lilain replied. ‘I suppose this is my punishment, then,’ Rhin mumbled. Rhin growled softly at her knack for being right. The faerie followed in Lilain’s shadow as they retraced their steps back to the fort. She was tired, and could feel without looking that the bandages around her knee had turned bloody again. A permanent sweat had affixed itself to her brow, and she leant on the crutch all the more with every mile. Fortunately, the fort was not far, and within an hour they had reached the out-buildings and were creeping through the lengthening shadows of their alleys. The sun was now lingering low in the sky, and the west burnt with oranges and yellows. Rhin shivered into nothing and ran ahead to check the door. The stone was still wedged against it, and once he had shoved it aside, the pathway seemed clear. ‘Off for dinner, I expect,’ she suggested. ‘Let’s hope so,’ Rhin replied, moving through the small gap in the door. The hinges squealed again as Lilain shuffled through. It was darker on that side of the wall, and Rhin had to blink hard to kick his night-eyes into action. They made it twenty paces before a shout rang out from the stable. A lone soldier doing the sunset rounds stepped out of a shadow and cocked his rifle. ‘I said stop!’ he shouted again. Rhin had already vanished, leaving Lilain alone to deal with him. She leant a little harder on her crutch, let her eyes go glazed, and bit her lip. ‘What are you doin’ back here, skulkin’ about?’ barked the soldier, as he came near. The orange sky painted his blue coat a dull brown, and set the bright buttons aflame. It matched his flaming red hair. The man half-lowered his gun as he looked Lilain up and down. ‘Major Doggard,’ Lilain began, trying to drop a little more croak into her voice, ‘You’ll forgive a beaten-up old woman, won’t you? I was just barterin’ for some meat, behind the wall. There was a man selling rabbits.’ Lilain hefted the bag. Doggard eyed the bag, noting the blood, and then back to the woman, noting her bruises and scrapes, and the way she used that crutch like another leg. Lilain smiled, a real smile, not a doddery old woman’s. She nodded her head. ‘You’re a good man, Major Doggard. You deserve better than a general like Lasp,’ she said, beginning to hobble away. The major flinched at that, but said nothing, merely waving her on. The major smiled and nodded, staring after the woman until she disappeared behind a curve of the wall. He scratched his head and whistled low. ‘All I’m saying, is that I’ve never seen anybody act so well under pressure before, especially in front of the major,’ Rhin said, from his hiding place between two barrels. Lilain flashed him a smile before tending to the jackalope. It was skewered on a spit, balanced between two boxes. Lilain turned it to roast on another side. She took a deep noseful of the smell. ‘Hurry up,’ she hissed at the roasting jackalope. Lurker was avoiding breathing through his nose at all. His keen sense of smell made his mouth water too much, made his stomach rumble like a landslide. Rushing magpie blood did have its downsides. ‘It’ll be ready soon, I reckon,’ he said, a secret prayer. ‘I hope so,’ Rhin muttered, nursing a growling stomach. Faerie appetites are not proportional to their size, and should never be underestimated. ‘Smells good,’ said a voice, and the three looked up to see Merion standing over them, hands in his pockets. ‘May I?’ he gestured to a spot next to Lurker, and Lurker shrugged. ‘I’ve seen plenty, I told you,’ Lurker rumbled. Lurker just grunted and lowered his hat. ‘You caught it then?’ Merion asked, intrigued. Lilain shook her head. ‘No, Rhin did. Quite impressively,’ she said, pointing to the little shadow between the barrels. Merion refused to acknowledge him. ‘Best huntin’ dog you’ll ever have,’ Lurker mumbled. He had obviously been at his flask. Alcohol never likes to let a silence go unfilled. Rhin hissed something in the Fae tongue and chuckled. Lurker chuckled as well, nudging the boy to see if he would bite. Merion just watched the flames, but spared a smile. He only spoke when the jackalope was being sliced and served. They ate it pinched between fingers and licked the grease off afterwards, swigging bartered wine and feeling like lords and a lady. ‘Fine meat. Well done,’ Merion said, and although nobody knew who exactly he was addressing, the boy was right. The jackalope was delicious. Between the barrels, a small smile curled around a mouthful of meat. Rhin took that as a good sign.